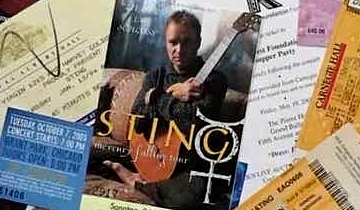 There are fans, and then there are “superfans” like Susan, a travel industry professional from the U.K. who’s seen Sting perform hundreds of times. Susan has crossed continents to see the former Police frontman play and she’s already got her tickets to catch him this summer as he teams up with Peter Gabriel for Rock Paper Scissors. Check out our interview for more on her travels, her fan philosophy, and her heartfelt message to Sting at There are fans, and then there are “superfans” like Susan, a travel industry professional from the U.K. who’s seen Sting perform hundreds of times. Susan has crossed continents to see the former Police frontman play and she’s already got her tickets to catch him this summer as he teams up with Peter Gabriel for Rock Paper Scissors. "...Backed by a four-piece that included two members of Texas band The Last Bandoleros, Sting then got the party started with his electronic-based Latin and Middle-Eastern flavored 1999 solo hit "Desert Rose" for which he had two midriff-bearing dancers onstage in thigh high boots. But then it was back to basics, as the girls left and he launched into a medley of Police songs."